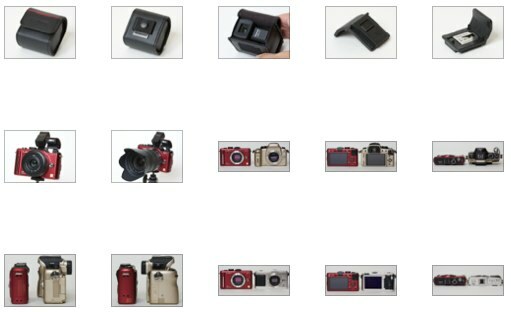 Last update (Jan 18, 2010): Robert Deutsch compares the GF1 plus 45-200mm vs Canon 5D plus 100-400mm. This post is a compilation of Panasonic Lumix DMC-GF1 12.1MP Micro Four-Thirds Interchangeable Lens Digital Camera professional and user reviews, owner opinions, reports and experiences, tests, conclusions, ratings and feedback. Hopefully, you’ll be able to conclude whether the GF1’s image quality, and the camera itself as a whole, meets your standards. However, since I use these lenses hand-held 90% of the time (or more), it’s a reasonable test of how they perform in my normal use. I did notice in comparing the four shots I took with each camera/lens that the ones taken with the 5D/100-400 showed greater variability in sharpness (different file sizes) than the ones taken with the GF1/45-200. The greater consistency of the sharpness of the GF1/45-200 images may be due to the more effective IS of the latest-generation IS from Panasonic compared to the first-generation Canon IS, or to my being able to hold the Panasonic combo more steady than the Canon. As I noted, I picked the best of the four images from each camera (the four from the Canon showing some variability, and the Panasonic images all being pretty much the same). It may well be that the 100-400L IS would benefit more from the camera being on a tripod then the 45-200. Still, if I’m not going to use a tripod when I normally use these cameras/lenses, it’s a moot point. For me, the practical difference between the 5D/100-400L IS and the GF1/45-200 combo is that there would have to be a specific reason for me to take the Canon setup—e.g., going to the zoo or a sports event where they allow DLSRs, and when I want to make sure that I’m using the best equipment I have available. The difference with the GF1 is that I can carry it with the 20 f/1.7 mounted, and the 45-200 is small enough to carry in a coat pocket “just in case,” and I’m confident that it will still allow me to get good photos. Also, the 100-400 is a BIG lens, and attracts a lot of attention, which may not be desirable. The GF1/45-200 combo is more unobtrusive. I’ve taken pictures with it at a couple of church concert events, and no one seemed to pay attention to me. I’m sure this would not have the case if I had been using the 5D/100-400! And the GF1 is a hi-def video superstar. It can change zoom and focus while you’re shooting video — something S.L.R.’s can’t do — although the refocus takes a second or so. Videos aren’t length-limited, either; you could record the entire school musical on, say, a 16-gigabyte memory card. And there’s a dedicated record button, so you never have to change modes to flip between stills and videos. These cameras proudly establish brand-new spots on the spectrum between little shirt-pocket cameras and great big S.L.R. cameras. None of them may offer Desirable Features 1 through 20, inclusive — no camera ever will. But if you’re willing to pay nearly double for better photos and less bulk, they come closer than any cameras have before. Lucky Singaporeans on the ClubSNAP forum managed to get their hands on the Panasonic GF1 on Sep 12, 2009, and one of the users posted his impressions of the GF1, and shared some re-sized (but unedited / unprocessed) test photos at ISO 200, 400, 800, 1600 and 3200. In my opinion, the ISO series images at this size look pretty good until ISO1600. Even the ISO3200 picture can be usable with a little chroma / color noise reduction in Adobe Photoshop Lightroom. I personally don’t mind a little bit of luminance “grain”, as long as tonality, colors and detail is retained as much as possible relative to the lower ISO images. 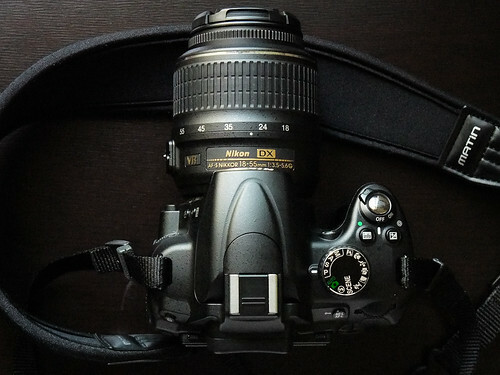 Focusing with the 20mm is as fast as my Nikon D80 with 35mm f1.8 dx prime. 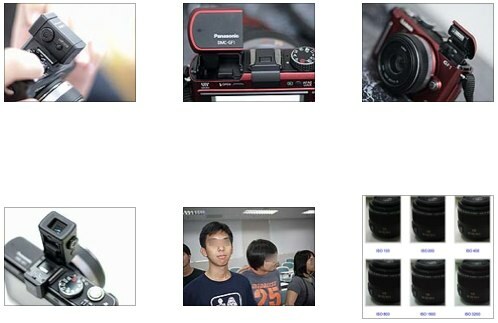 In the same forum, davidsim posted his mini-review of the GF1, which also has a quick comparison of the GF1 vs Olympus EP1. The GF1’s pop-up flash is tiny, and the mechanism feels flimsy. AF / autofocus speed on the GF1 is noticeably faster than on the Olympus E-P1. The Panasonic Lumix 14-45mm kit zoom lens is quieter in operation, and the front element does not rotate when focusing, unlike on the Olympus Zuiko m4/3 14-42mm lens. The red model looks good, body color-wise. Aesthetically, the E-P1’s retro look is more attractive. Rear LCD is bright, crisp and more useful for manual focusing. 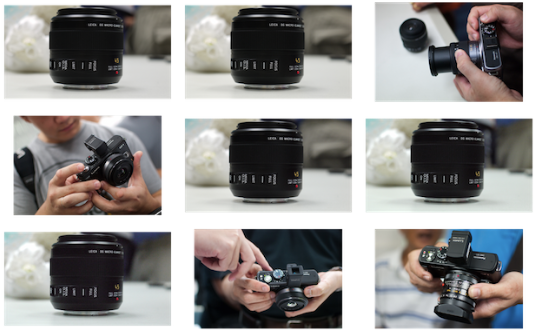 The zoom ring on the Panasonic’s kit lens rotates in the opposite direction compared to the E-P1’s kit lens. The GF1 uses the same, pricey Panasonic DMW-BLB13 Lithium-ion rechargeable battery pack as the Lumix GH1. An interesting point was raised on the numerous user reports about slow-focusing on the E-P1 — it seems to be related to the 14-42mm kit lens supplied by Olympus. Davidsim reported that AF performance on the E-P1 was hugely improved when he mounted the Panasonic 14-45mm zoom lens on the camera. pphyll added that the AF speed on the Panasonic GF1 plus 20mm f/1.7 is comparable to that of the Olympus E-P1 plus 14-42mm. The EVF is definitely not sharp enough for accurate manual focus — use the LCD screen instead. The GH1 / G1‘s EVF is better suited for manual focusing. 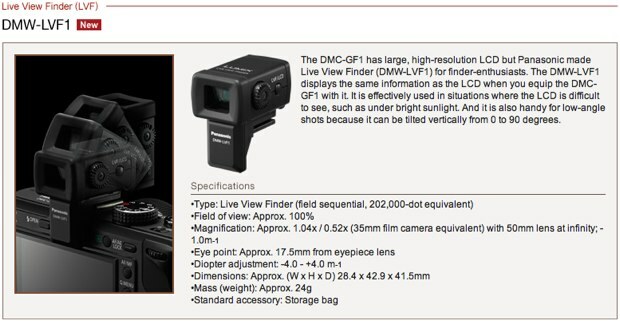 Visit Panasonic.net for a more detailed description of the DMW-LVF1 external Live View Finder, and Panasonic Australia for a larger, more detailed image. For a deeper coverage of the effectiveness of the GF1’s pop-up flash and the DMW-LVF1 viewfinder, head over to David Tong’s Hands-on Mini-Review of the Panasonic Lumix GF1. David also provides 100% crops from images testing noise control at ISO 100, ISO 200, ISO 400, ISO 800, ISO 1600 and ISO 3200. The insane cost of accessories for all Panasonic camera models is a major turn off, with a standard-capacity battery costing twice as much as Canon/Nikon DSLR high-capacity batteries will be tough to swallow especially if you’re buying the GF1 for travel and you need multiple batteries. The LUMIX G VARIO HD 14-140mm/F4.0-5.8 ASPH is a wonderful and unique lens offering superb optical qualities, focal range, and focus speed, but it’s a tough sell at the same price as pro-grade lenses from Canon and Nikon. If you’re having difficulty deciding on whether to purchase the Olympus PEN E-P1 or the GF1, read Radiant Lite Photography’s Olympus E-P1 vs Panasonic GF1 comparison, which has a list of pros and cons for each camera. Olympus E-P1’s strength is its compatibility to a wide range of lenses, from micro four third lenses and four third lenses via adapter. It also has built-in image stabilization, meaning you are not restricted to only lenses with that have the image stabilization built into them. This article at DC.Watch (Google’s English translation) has more photos of the GF1. 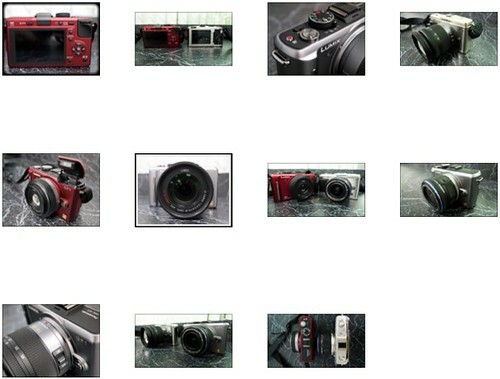 Those interested in the optional DMW-LVF1 viewfinder, the pop-up flash and side-by-side photos of the GF1 next to the Olympus E-P1 and DMC-GH1 should check the article out. For me, there’s something robotic-looking about the GF1 with the flash popped up plus EVF plus 14-140mm lens.